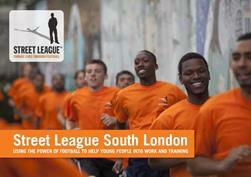 Street League are recruiting for their Academy Programme. The programme starts on Monday 9th February 2015 and can accommodate up to x20 young people. The Academy programme is for 16-25 year olds that are not currently in employment, education or training. The Academy uses the power of football to develop employability skills and gain accredited qualifications. The qualifications are more suited towards people progressing into sustainable employment opportunities. Each person will receive 1-2-1 support to help them progress employment. Street League have a dedicated Employer Engagement Team that broker job opportunities and provide people with interviews for work experience and job opportunities. These services can only be accessed by Street League Academy participants. There is dedicated Aftercare Coordinator that is responsible for working 1-2-1 with young people once they have completed the Academy programme to continue to support them on their journey into employment.